This week-end in Budapest after a nice seminar organized by Lazslo, we went to a zoo where I had the honour of meeting the “king of the animals”, a baby lion (5 months old). I have been living with cats all my life (I have 3 cats) and this chance offered by Lazslo to meet an actual lion was something I was eager to experience. Before I entered the cage, another man was playing with him and it was nice to watch. I was hoping to have the same kind of playing time with the young lion. But as you can see on the picture, when I entered the cage, the little guy got so frightened of me that he stepped back and didn’t want to getting close to me. 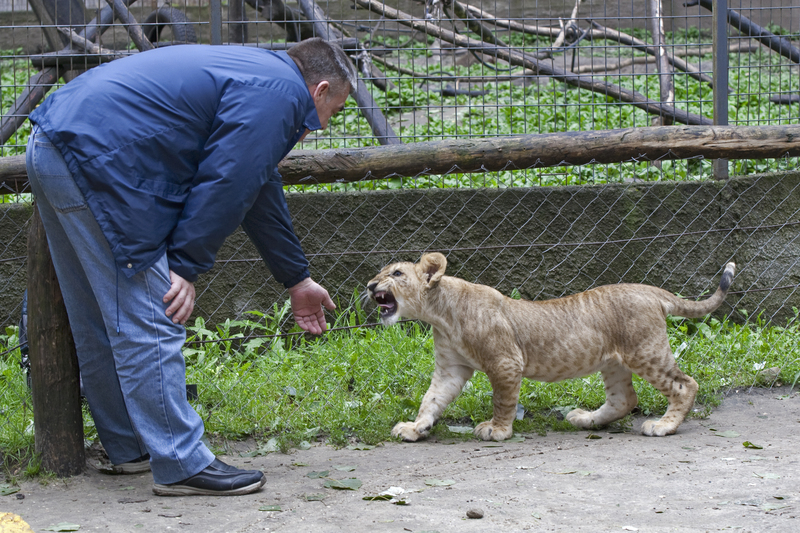 At what point he eventually yelled and “roared” at me while getting protected behind the leg of his trainer. It took him 30 minutes to come to me but he never stayed. When he was away, his eyes and ears were always turned towards me. Nevertheless I found that interesting and sad. Interesting because it proves that the sakki might be really something that is changing our attitude, and sad because I would have loved to play with this oversized kitty as I do with my own cats. When we undergo the sakki test, something is revealed and grows and unfolds more over the years, this is why training is so important. Truth does not lie in the technique but in the attitude. Funny, the King Bear scares young lions. I am lucky to know you as a friend and a master, in my every day life all your knowledge help me so much. I can experiment every day in my life and job this principle of scary happiness, the more i get happy and open, the more things reacts around me. thank you to show me the way. Attitude is almost…everything. Who you are is one thing. How you act, adapt, behave is another. Stay in the flow, be involved but at the same time put some distance between you and the action.